Nick Rowe has a piece today on Canada's monetary policy targets and instruments, in particular talking about simple rules for conducting monetary policy and their interpretation. 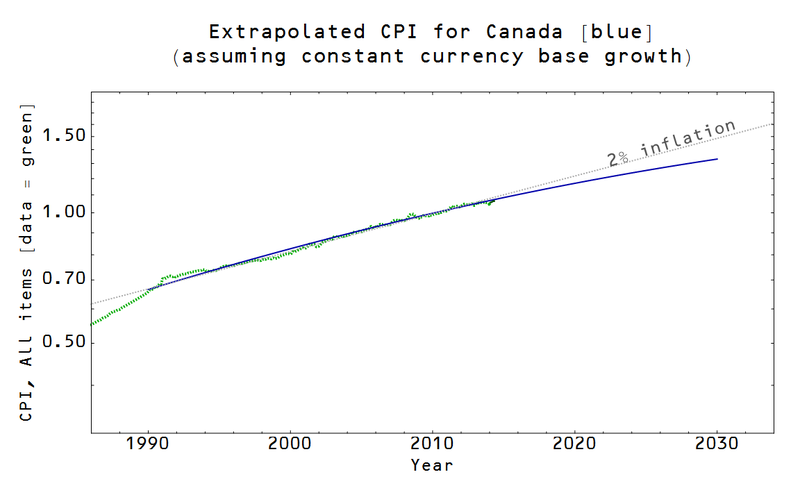 Both Rowe and Scott Sumner have pointed to Canada as evidence that central banks can achieve whatever inflation rate they would like. 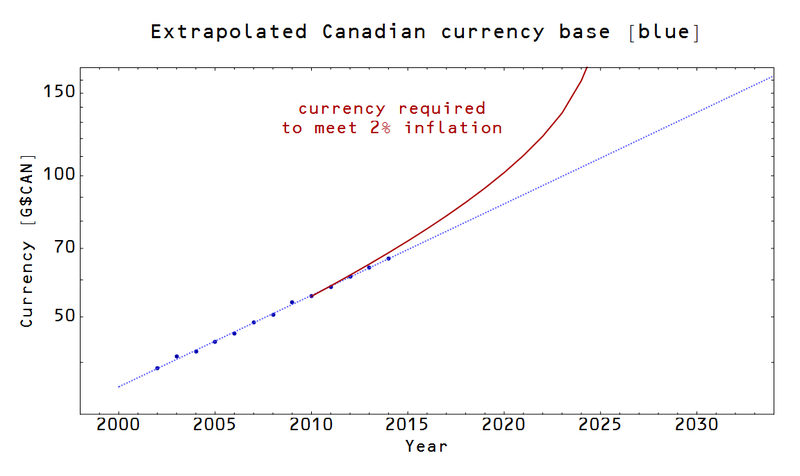 I'm going to put forward a prediction, using the information transfer model, that Canada will either undershoot its inflation targets or will have produced significantly more currency than the current log-linear trend. The interesting thing about this prediction is that it should start to become apparent by the end of next year (Dec 2015). I will add that this actually makes me a little suspicious of the model itself, and is therefore part of the reason I'm putting this prediction out there. One should always be suspicious of predictions that say behavior is just about to change (e.g. we're on the verge of massive inflation; we're on the verge of secular stagnation). Additionally, there is a possibility of a "squishy" outcome by the end of 2015: the currency base may increase a little and CPI may undershoot a little -- that would just push the decision point out a year or so. I used a simple log-linear extrapolation for N = NGDP from FRED and M = "M0" the currency component of the monetary base using Bank of Canada note liabilities data. Here P is the CPI, all items from FRED. Note that k function is the inverse of the usual kappa; it simplifies the equation a bit. Thanks Tom for bringing it to my attention. The red curve in the graph above assumes that you are exactly meeting your inflation target, so it can't be compensating for past undershoots (there aren't any). And if you exactly meet an inflation target, you a fortiori meet a price level target. Sorry for pre-annoying Nick over there for you! Your answer makes sense though. Cool.